So, fall is on its way. Maybe there's a little nip in the air. Maybe the leaves are changing. Maybe you live somewhere that's nice all year round so you don't need to worry about the oncoming winter. Nice. Either way, when autumn is on its way the atmosphere tends to get a little dark. Don't get us wrong, we actually like it. When the world gets darker it sets off a switch that sends us searching for spooky stories, pumpkin spice flavored lattes, and cable knit sweaters. And there's one way to truly embrace the dark, atmospheric lighting. Sure, it might seem counter-intuitive but there's nothing like a flickering yellow light to make you realize how dark the street around you is! 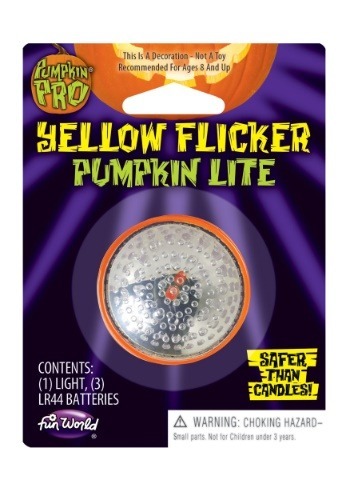 If you're displaying Jack-o-lanterns this Halloween season, these battery operated lights are a safe and reliable alternative to candles. With a warm yellow glow and a flickering light, no one will even know you're using the wonders of technology to add atmosphere to your Halloween decor! So, maybe you're the type who leaves a bowl of candy out and huddles in front of a scary movie on Halloween night. Or perhaps you go all out, piping a spooky playlist into the night air and answering the door as a creepy mad scientist. Either way, the light allows you to focus on the holiday rather than keeping your lit pumpkins secure. Safe to say, this new shortcut makes for a happy Halloween.